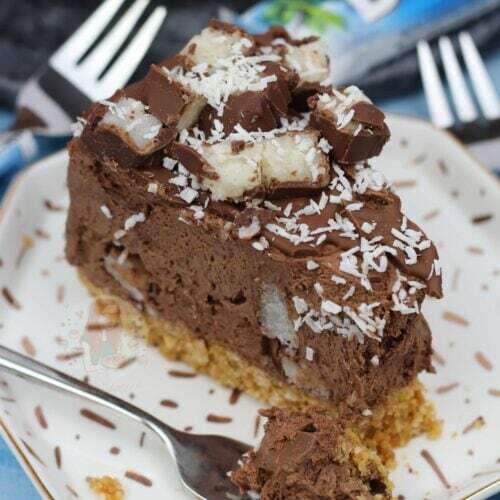 A Coconutty, Sweet, and Delicious No-Bake Bounty Cheesecake that is guaranteed to satisfy anyones Coconut & Cheesecake cravings! 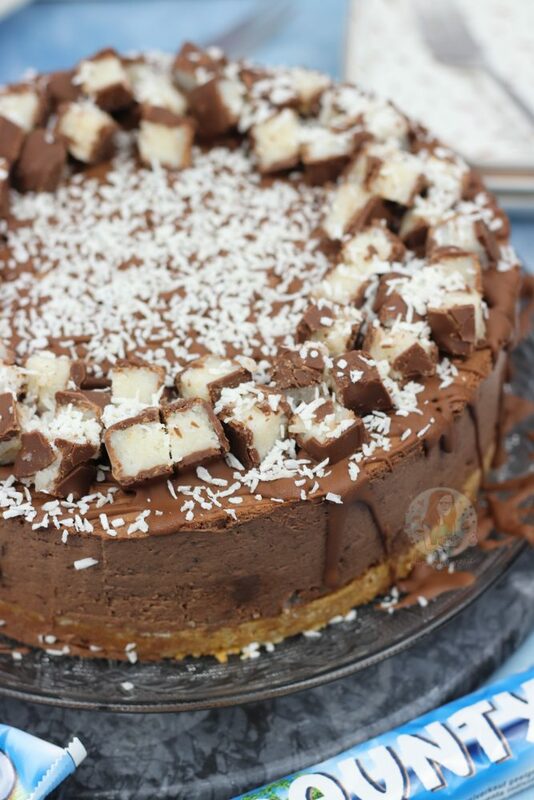 I have been wanting to post a Bounty related cheesecake for a while, as I recently re-discovered my love and adoration for them. 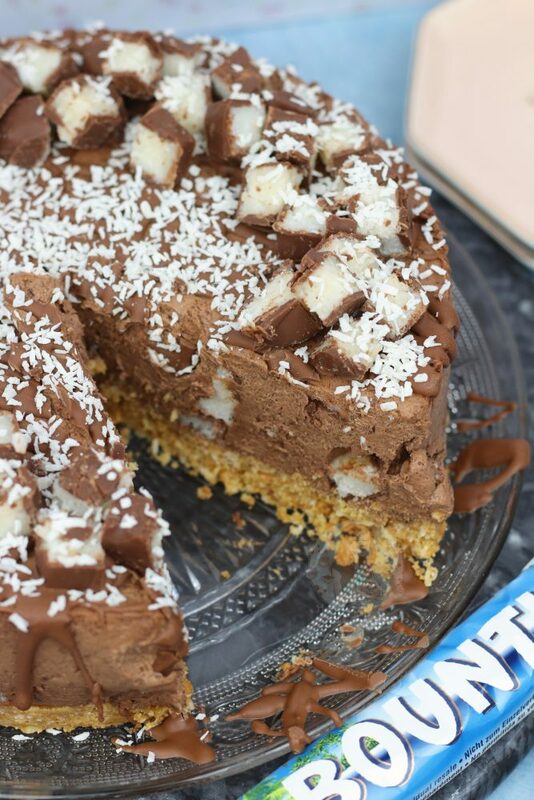 I love coconut bakes, such as my Coconut Loaf Cake, but when I was younger and was given the box of Celebrations I always said I hated Bounty bars as all I wanted was the Maltesers.. needles to say, I made an error here. When I was shopping the other day for ingredients, I decided to pick up some of the Bounty Spread you can now buy (find it near the Nutellas) and oh my days it was delicious! The spread itself isn’t too strong in a coconut flavour, but its the perfect amount when mixed in with chunks of Bounty. Using a touch of vanilla in the cheesecake was the perfect mix for me, but this is of course optional! 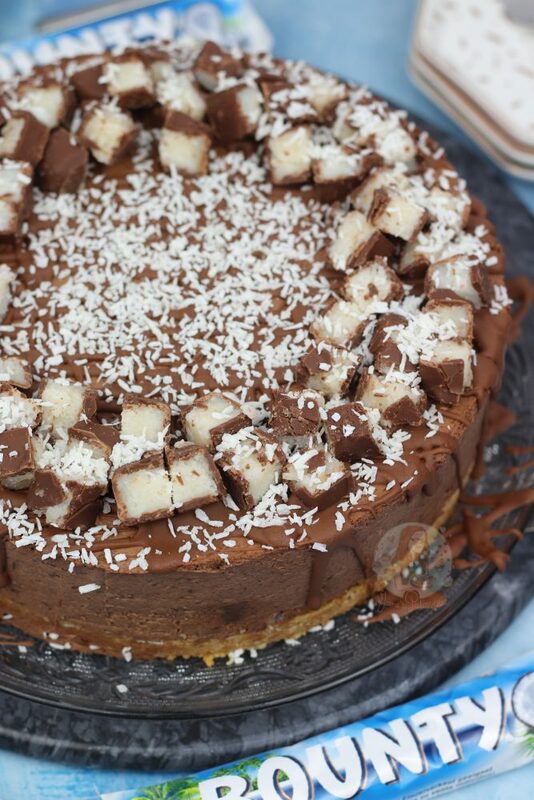 I decorated my cheesecake with drizzles of chocolate, even more bounty and then some delicious toasted coconut! You can toast your coconut by using about 25g of desiccated coconut and putting it into a dry frying pan on a low-medium heat and moving it around with a spatula. It’ll take a while to start, but once it starts toasting it’ll change quickly to the delightful golden colour! I based this recipe on the idea of my other cheesecakes, such as my No-Bake Mini Egg Cheesecake. I wanted to get oodles of coconut flavour into it after the success of my Coconut Brownies, and I hope I did that in this delightful dessert! I used a pack of 7x 57g Bars of Bounty in these as the pack was cheaper than any others in the supermarket in comparison to the weight of them, but any will do! 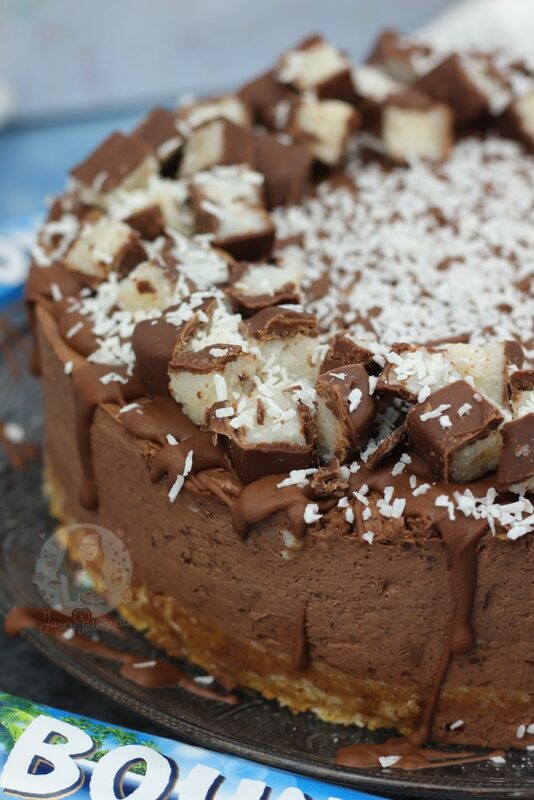 I also had to use less Double Cream in this recipe in comparison to other cheesecakes because the Bounty Spread is actually a ‘milk spread’ so goes reasonably runny once beaten in comparison to spreads such as Nutella. You can see notes below on how to make this without the spread! RECIPE UPDATED AUGUST 2018 – This recipe now differs from what it was originally, and what is stated above as for the last 6 months or so, I haven’t found Bounty Spread ANYWHERE. It’s tragic to be honest, and I’m pretty sure they have stopped selling it, so I’ve update this recipe so it doesn’t include it anymore. If you still manage to find Bounty Spread, there are notes below on how to make the original cheesecake! Because of wanting to keep a Coconut Flavour, but not having the Bounty Spread anymore, I thought I would through it out there and have a complete and utter experiment, and use Coconut Cream instead of Double Cream. It was definitely a new experience, and I had wondered if I had bought the wrong thing at first, but turns out it worked very well. It’s important to use coconut CREAM and not milk. I did refrigerate my coconut cream before using it, as it usually comes in the dried foods section along with Thai foods, so its not a dessert type cream really. You can easily use it however, it just helps that its cold, along with the Cream Cheese. To make sure that it set properly, I did add in melted chocolate to the recipe (which the original didn’t have), and it was delicious. 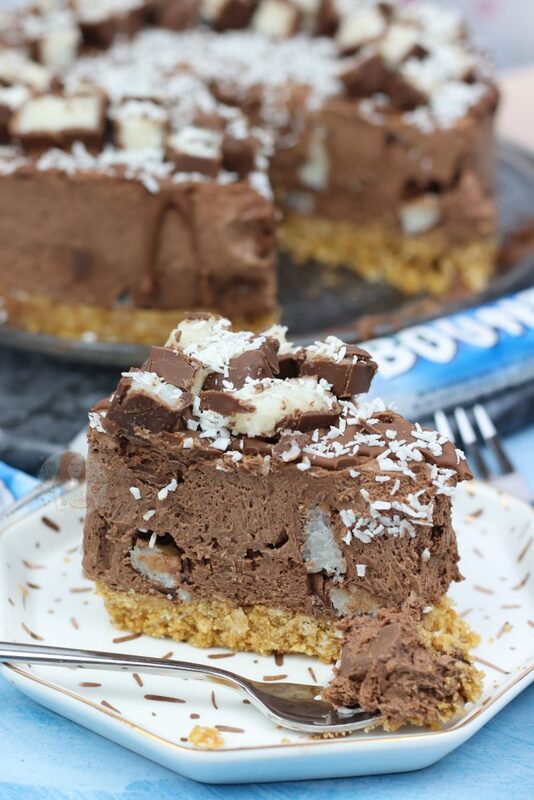 Using the melted chocolate (you can use Dark or Milk), made it just like a bounty bar in cheesecake form, and when the Bounty bits were added it just became next level. I also decided to use regular Digestives, and add in desiccated coconut, rather than chocolate Digestives so it wasn’t tooo much chocolate! If you have any questions, leave them below in the comments! 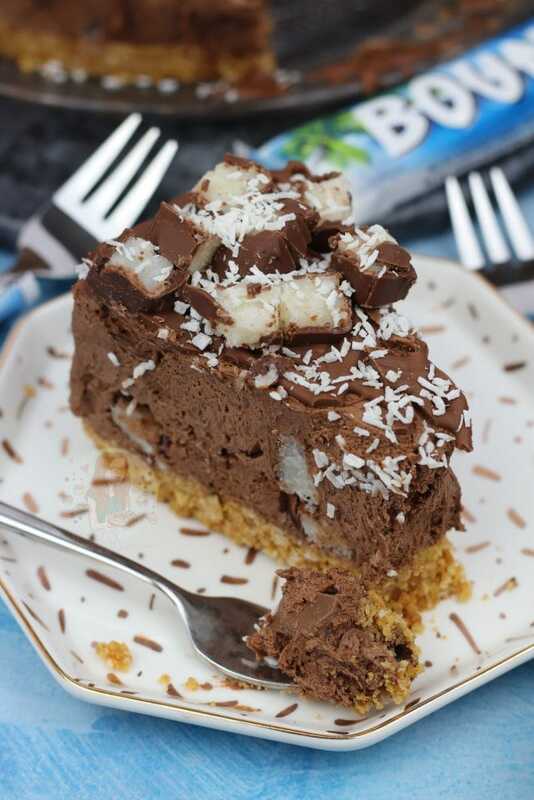 A Coconutty, Sweet and Delicious No-Bake Bounty Cheesecake that is guaranteed to satisfy anyones Coconut Cravings! Blitz the Digestives Biscuits and the Desiccated Coconut in a Food Processor until smooth. Add in your melted Butter, and blitz again till combined. Press into the bottom of a Deep 8"/20cm Springform Cake tin, and refrigerate whilst you do the rest. Melt your Dark Chocolate carefully, and leave to cool for a couple of minutes so its not piping hot. In a large bowl, add your Cream Cheese and Icing Sugar and whisk till smooth. Add in the chilled Coconut Cream,and then whisk again till smooth. Add in the slightly cooled melted Dark Chocolate, and whisk till thick. Check the mixture every now and again to make sure you don't overwhisk. Once thick, fold through your chopped Bounty bars, and spread the mixture on top of the Biscuit Base. Chill the cheesecake in the fridge for at least 5-6 hours, or overnight. Once chilled, decorate! I drizzled over some Melted chocolate, added on some chopped up Bounty Bits, and sprinkled on some Desiccated Coconut! This recipe will last for 3 days once made, in the fridge. 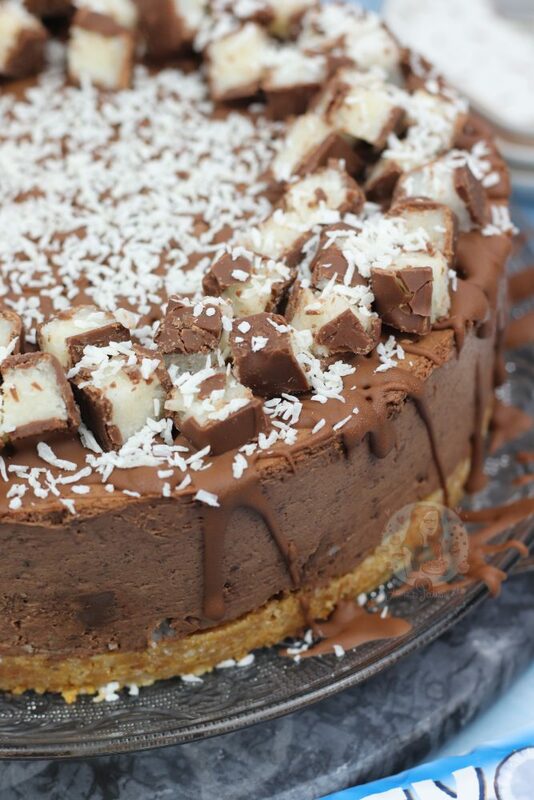 The bounty bars on the inside of the cheesecake are optional, but tasty. I use Sainburys Coconut Cream, but most supermarkets sell it in the Thai section. For the Base - Blitz the biscuits and butter together and press down. Older Next post: Rolo Cookie Bars! Newer Previous post: Kinder Bueno Cupcakes! I’ve bought all of the ingredients to make your bounty cheesecake. I have made it before, but I’m unable to buy Bounty spread as it’s no longer available to buy at Asda, Tesco or Sainsbury’s. Is there a substitute? Or can it just be left out? Thank you for the recipe I have made it just looks like the picture need to eat it yet but it looks good . With all your no bake cheesecake recipes is it ok to make the filling half the size and will it still set? When you say the double cream starts to ticken, do you mean i should stop mixing at soft peaks? You ideally want it as thick as you can – thicker than soft peaks otherwise it would stay too soft. Judge it as you go really! How do you get the cheesecake off the the cake tin base?